UPDATE: Switch to tax reform tax tables, deductions, & exemptions for 2018. This article was originally written prior to the passage of the Tax Cuts and Jobs Act of 2017, click below for an article containing the new tax brackets. While Congress and the President argue about a new tax reform plan, the IRS continues to work away with the tax code we currently have. Each year, the IRS updates the existing tax code numbers for items which are indexed for inflation. This includes the tax rate tables, many deductions, and exemptions. The following are the tax number which will be in effect beginning January 1, 2018. 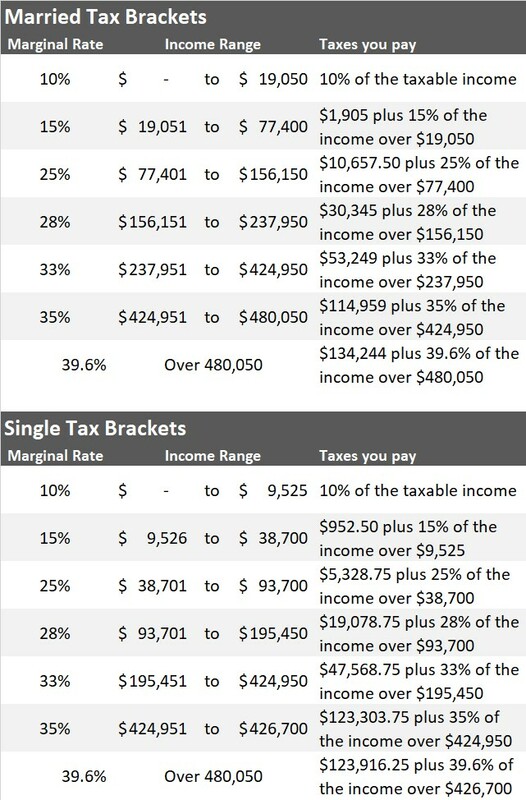 The image shows the 2018 tax brackets which you will use to calculate your taxes to be filed in 2019. Every tax bracket got a little bump up in size, allowing more of your money to be taxed at lower rates. Understanding the tax brackets will help you to estimate your potential tax liability next year. Armed with your estimated taxes, you then have until December 2018 to make charitable contributions, invest for retirement, or do other things which can help manage and lower your tax liability. The standard deduction is an amount every taxpayer is allowed take as a deduction from their income to reduce their taxable income. The standard deduction is used by individuals and families who do not itemize or who have itemized deductions less than or near the standard deduction. In addition to the standard deduction, each taxpayer can further reduce their taxable income by the personal exemption for each qualifying household member. To determine if a household member qualifies for the personal exemption, ask a professional tax adviser about your individual situation. $5,600,000 – The amount a person can pass on to their heirs which is exempt from estate taxes. The estate tax is effectively a tax on dying, where the Federal Government takes up to 39.6% of the value of the estate. Fortunately, an estate tax credit creates an amount you can pass on to your heirs without being taxed. You can also avoid the estate tax by gifting small amounts each year to your heirs. Gifts of less than the annual gift exclusion are passed on tax-free, while gifts over the exemption amount could be subject to the unified gift and estate tax. What per person, per person means: The gift exclusion applies to each person an individual gives a gift to. So a married coupe with a son and daughter could gift a total of $60,000 per year to their children. $15,000 from father to son; $15,000 from father to daughter; $15,000 from mother to son; and $15,000 from mother to daughter. If the children were married, an additional $60,000 could be gifted to their spouses. The Alternative Minimum Tax has unfortunately become the bane of the middle class. Originally created to tax ultra-high income individuals a minimum amount, for decades it wasn't indexed for inflation. As a result, the tax now effects millions of Americans who definitely don't qualify as ultra-high income. The AMT offers fewer deductions, increasing the taxes owed by individuals. (It hit my wife and I last year). The AMT offers a much higher exemption than the traditional tax code, which is designed to avoid middle-class taxpayers from being hit by the AMT. Up until recently, this exemption amount was not indexed for inflation, meaning middle-class households have ended up being a majority of the AMT taxpayers. The exemptions are now indexed for inflation, which doesn't solve the problem but keeps it from getting worse. Another aspect of the AMT which causes it to hit middle-class households is the exemption phaseout. Again, as it wasn't indexed for inflation in the past, the phaseout begins squarely in the middle-class. If your income is over the above amounts, you'll begin losing your exemption which will increase your AMT tax faster. 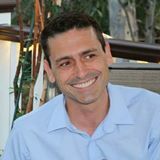 Income over $191,500 – Joint Returns, individual returns, estates and trusts.